She’s a BODYATTACK addict determined to make the Middle East proud. Introducing Stef Weston! Will she be “The One”? I am a freelance BODYATTACK™ instructor in DUBAI, I teach at different clubs especially The Aviation Club and Talise Fitness. I am a full-time flight attendant, but I have always been a sporty person from as young as I can remember. Being a flight attendant I used to find it hard to motivate myself to go to the gym, being so tired all of the time. One day I managed to get the courage and step out of my comfort zone and go and try a BODYATTACK class at my local club. It just so happened that Kate Slee, who is a total machine on BODYATTACK 90 DVD, taught me my very first BODYATTACK class. I needn’t say any more, I was hooked instantly and became addicted to Les Mills classes overnight. 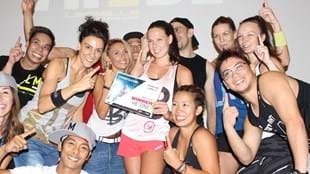 After moving to Dubai I trained to become the BODYATTACK instructor I aspired to be. And now it doesn’t matter even if I land off a 16- hour US flight, I always want to go to the gym to teach a BODYATTACK class. BODYATTACK 100%. You can take the girl out of BODYATTACK, but you can’t take the BODYATTACK out of the girl. I eat, sleep and breathe BODYATTACK. My favorite track is definitely track 8, in every single release; together you can feel the music, the love and the energy. It’s contagious. I love seeing people grow. The people that come to your class for the first time, connecting with them, spending time helping them transform themselves and seeing and sharing the results. I have made many great friends. If you do something you love, you never have to work a day in your life. Being selected as THE ONE DUBAI. I think back to the moment when they said my name, and I have to pinch myself to see if I’m dreaming. This journey has been incredible from the start, once in a lifetime. I have only been teaching BODYATTACK for just over a year, and I am beyond excited to how much I will learn and experience at #ONELIVE Stockholm and at our #ONELIVE Dubai event in November. I will do Middle East proud. And I look forward to meeting the other contestants. Tell us how you pass on your motivation? Every time I step on stage I create this bubble. The studio becomes this bubble of positive energy, motivation, fun and fire. As I travel a lot all over the world, I love that LES MILLS is ONE TRIBE. It’s like one big family, one big bubble. Wherever you go, whoever you are you can share and pass on your passion and enthusiasm with others that share that same feeling. Les Mills is changing the world for a fitter planet and I am so happy to be a part of that. Never stop believing. Never give up on your dreams. Set yourself a goal, but don’t just achieve it, SMASH IT! And of course KIA KAHA! What is your best fitness tip? Step out of your comfort zone, it’s good for you. Fitness is about mind over matter. Challenge, commit and succeed. CHOCOLATE, ICECREAM, CHEESECAKE!!! Oh and shopping, I’m a bit of a shopping addict. At the moment my playlist is all of BODYATTACK 90, it was recently launched in the Middle East, I just love it all. I’m still trying to perfect the Irish dance my idol, Lisa Osborne does in track 8, it is awesome! I also love a bit of old school BODYATTCK. Diamonds track 3 I will always have a soft spot for as this was one of my tracks for my initial training module.